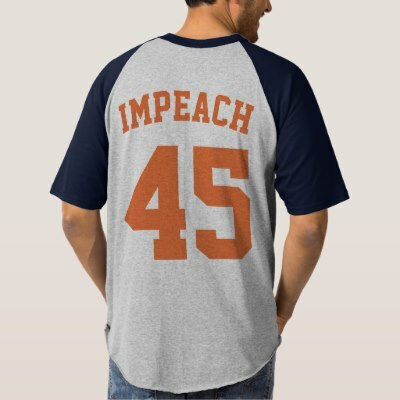 Journal de La Reyna (World News Today): Walmart Selling Impeach 45 Tees! Conservative outrage over Walmart selling t-shirts with the words "impeach 45" over it. The shirt is play on Rep. Maxine Waters (D-CA) relentless call to impeach that imbecile Donald J. Trump. Conservatives want a boycott against the company. Walmart.com sells these products online and it is done through third party. Old Glory, the company that promoted the product. It is noted that the website sells pro-Trump swag. It seems like reactionary outrage from some trolls and it won't stop them from shopping at Walmart. They support capitalism. The definition of capitalism is "rich vs. poor." Damn shame they won't boycott Walmart for driving out small businesses. Damn shame they won't boycott Walmart for causing sprawl. Damn shame they won't boycott Walmart for the unfair pay, unfair work hours, and numerous scandals that plague the company. But a freaking tee.... seriously!